Many entrepreneurs looking to build a successful tech startup have thrown their hat in the ring but, in terms of deep tech innovation, Ireland is punching well above its weight. The quantity of ambitious firms has never been an issue for Connor Cantwell, European partner at Cosimo Ventures, who has had initial meetings with more than 1,000 new firms across Ireland and the UK in the last year. As for quality, however, not every company claiming to be a disruptor in their industry is worth their salt. "Last year, everyone was pitching themselves as AI (artificial intelligence). This year, everyone is fashioning themselves as blockchain, but it's the genuine article we're looking for," Cantwell told the Irish Independent. "The word disruptive is used - and abused - a lot. We invest in deep tech - so IoT (Internet of Things), AR (Augmented Reality), AI, cybersecurity and blockchain technology. "We want firms that have a little bit of depth about them; now they're startups, and we were all there, so they're going to have holes, but do they understand those holes? "Do they have a scalable business plan? Can their uniqueness been defended; has it the potential to be exponential?" With offices in Dublin, Boston and New York, Cosimo has always been focused on firms that they can make a real impact from - startups with global ambitions looking to get unto the US market. And Ireland, it seems, is very much holding its own. "There's an above-average quality here relative to what you would see in other markets, we compare exceptionally well. 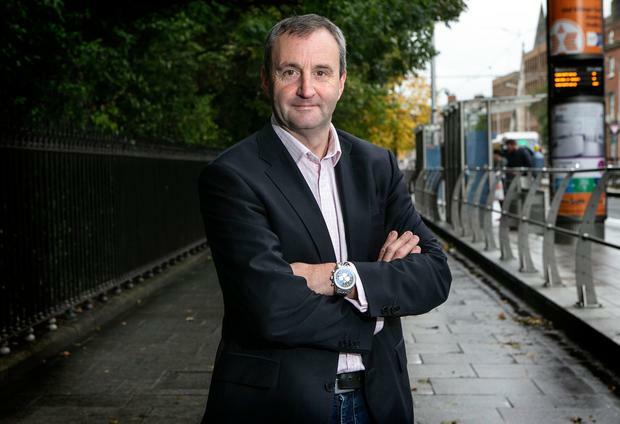 Entrepreneurs in Ireland tend to be more realistic, pragmatic, externally focused, there's not that Silicon Valley mindset where a $1m cheque is expected," he said. "I know there's room for improvement, but we do get a lot out of what we can. The average startup here is starved of capital, particularly at seed level, there's not enough money in the ecosystem. "Companies here are very scrappy, give them a euro and they'll get a euro plus value out of it every time. That mindset is very different to companies elsewhere." As former entrepreneurs and tech pioneers, the Cosimo team's passion for finding talent is evident in the hands-on approach they take in terms of sourcing, selecting and embedding their emerging stars in the US market. But neither have they rested on laurels in terms of their own industry's development. And the fact that they have been heavily involved with blockchain in the past few years led them to realise its potential application in the venture capital (VC) space. "This industry hasn't changed in years, it's never changed. There was a sort of dawning realisation that we could disrupt our own industry. With Cosimo X, we still continue doing what we've always done, selecting really disruptive deep tech companies, none of that changes," said Cantwell. According to Cantwell, the new tokenised VC fund will have a particular focus on blockchain technology in early-stage firms, but the added bonus for investors is that it is structured to allow enhanced liquidity, and increased access to the asset class. "Investors buy tokens and those funds are then invested into those deep tech companies that we've always been chasing. Traditionally anybody putting money into a venture fund essentially lock their money away for up for around 10 years. This liquidity is massively attractive. "And with a minimum investment of $10,000, the VC asset class is now open to the guy on the street. The fund is democratising access to venture capital." Cantwell joined Cosimo around three years ago after his own startup and exit adventure; departing from a high-level career at Nielsen, he founded software and analytics firm 20-20 Insights and later sold it to Swiss Post. Now, the Dublin-based partner is active in working with around 140 'deep flow' partners across Ireland and the UK that he sources companies from; accelerators, incubators, etc. And he has witnessed a change in the Irish landscape. "The infrastructure is less Dublin-centric now and, even in the last year, we've seen incubators from Waterford and Galway. The first cohort out of the Shannon programme [a new incubator for startups in the aviation and travel tech sectors] are really impressive, way above expectations." Cantwell's annual whittling down process generally results in five or deals annually and there are currently two UK companies and three Irish firms - involved in IoT, AI and blockchain respectively - under his umbrella that are being put through the six-stage process. "There are any amount of Irish firms out there who will tell you they spent a ton of money in the US market and went nowhere. "We're coming at it from a different perspective, we're opening the doors, getting them in and supporting that without blowing budgets."